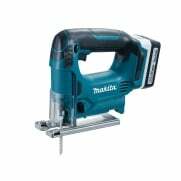 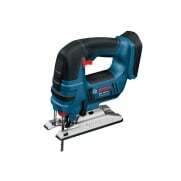 The Bosch GST 18VLIN Cordless Jigsaw has a compact, lightweight design with small grip circumference that enables optimum control when sawing. 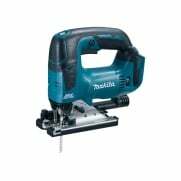 Has a plastic-coated aluminium base for better gliding and protection of surfaces, plus permanently switched-on blower function for clean working. 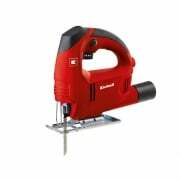 It is fitted with an ergonomic bow handle with large soft-grip coverings for comfortable working. 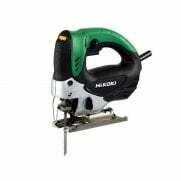 It offers tool-free, one-handed saw blade changes thanks to the saw blade ejection system and the park position function for safe and quick blade swaps. 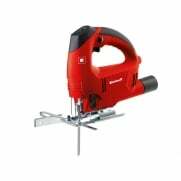 There is also an anti-splinter guard and a 4 stage pendulum action for tear free cuts. Continuously variable accelerator function is ideal for precise sawing starts and for plunge cuts.